Kusha Bhave is a name, which has remained hidden in pages of history with reference to life stories and details of closest devotees of Sai Baba. It was practice of Sai Baba of Shirdi to give nicknames to His devotees in accordance with their nature or physical characteristics. Devotees who got such names as a blessing from Sai Baba, accepted the names and were addressed thus thenafter. Kusha Bhave is one such name given to a devotee who has originally named as 'Krishnaji Kashinath Joshi'. Being one of the gems of the court of Sai Baba let us now see few astonishing facts about his life and even more how he was blessed by Sai Baba with a special power of re-producing Udi. Krishnaji Joshi was born in a village named 'Mirja' about 70 miles away from Ahmednagar to Kashinath Padmakar Joshi in the year 1866. Belonging to a poor family, after completing his schooling, he served as a teacher in a small school of his village with a monthly compensation of Rs. 5-6. He even did poojas, by learning their family worship. But he was not interested in spirituality. Thus he made Dutta Maharaj his Guru and learnt occult powers and started practicing them. To use and practice physic and occult powers, Kusha Bhave had to wear a thick iron bangle. Till 1888, i.e. at an age of 22, Kusha Bhave had possessed almost all physic and occult powers. At the same time, his guru decided to go to Himalayas and attain Samadhi there. Kusha Bhave accompanied his guru till Delhi. 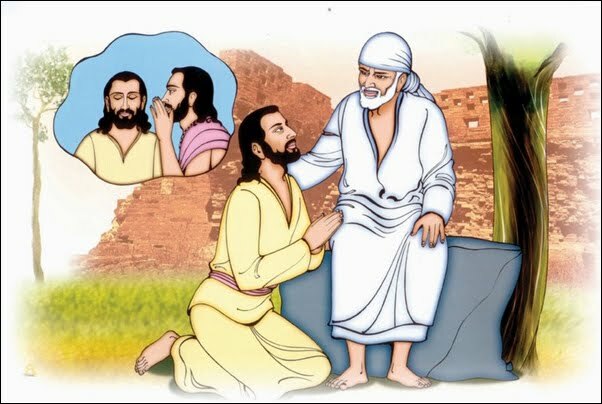 In the moment of separation, Shirdi Sai Baba was introduced to Kusha Bhave by his own guru and was adviced to abide by His teachings and follow them thenafter. In a note, the guru addressed Sai Baba as his elder brother, "Majha Vadil Bhaau". After 20 years of the above mentioned incident when Kusha Bhave went to Shirdi, Sai Baba welcomed him with these words, "Take off and throw away your iron bangles. You will be granted entry only upon doing this". Sai Baba's words were Kusha Bhave's immediate actions. He immediately parted off with the so-called bangles (and also occult powers). As Kusha Bhave came to Shirdi with empty pockets he had to liave by begging alms in Shirdi. He was entrusted the duty of reading 'Das Bodh' composed by Ramdas Swami by sitting in a corner of Dwarkamai. Wherever little space he found, it would be his bed stead. Though always ready to take Sai Baba's orders and acting on them, Baba till then did not give him any updesh or mantra. At suitable times, Baba took every possible care to show way to Kusha Bhave and ensured his spiritual upliftment. In fact, Kusha Bhave was advised to leave off physic and occult powers. Here is an interesting incident which took place on Ekadashi day and following conversation took place. Baba: What do you eat on Ekadashi? Kusha: Nothing as it is Ekadashi. Baba: What is the meaning of Ekadashi? Kusha: As it is Roja. Kusha: We keep fast and that means that we do not eat anything except sweet potato. Baba: Oh, you eat onion now. Take this and eat it. Baba repeatedly pressed Kusha to eat onion and trying to escape the situation, Kusha said, "Baba, if you eat this onion, I will eat it". Baba readily ate onion and so was done by Kusha. Meanwhile some devotees turned up in Dwarkamai. Baba thought of playing prank. Baba: See, Bamaniya (a word 'Brahmin' used in distorted way), he is eating onion on Ekadashi day. Kusha (giving explaination): Onions were eaten by both Baba and me. Baba: No, I have eaten sweet potato, see, see! Saying so, Baba vomited and sweet potatoes were visible in the vomit. Within no time, considering Baba's vomit as prasad, Kusha placed sweet potatoes in his mouth. Baba, simultaneously beating and scolding Kusha, said, "Have you gone mad, why did you eat my vomit?" But was Kusha to listen to Baba's scolding or pay any attention to Baba's scolding? It was a blessing to him in disguise. Even Baba's heart melted like wax. Baba placed His boon bestowing Hand on Kusha's head and said, "I give you a blessing. Meditate on me and open your fist, you will receive prasad. Whenever you act so, Dwarkamai's Udi will be present in your hand on its own. Distribute this Udi among the devotees. They will be benefitted and you will get its boon". Hey Hetal, many thanks to you for sharing this story. You are absolutely right that Kusha Bhave's name was hidden in pages of history, but thanks to you for revealing it to all of us.